Regardless of what holidays you celebrate, this time of year is filled with traditions. Some people celebrate Christmas by feasting on prime rib (which I remember predicting would be the “in” holiday food in 2009… can anyone recall if that actually happened? ), while others prefer a traditional ham. Over the past decade, most of my Christmas meals have been centered around soups or stews like gumbo or chili, which can be made in advance. Though this isn’t a tradition that I grew up with, it’s one that I freaking love because it frees up your time and allows you to get to hangout with your loved ones rather than slave over a hot stove all day. As I always say, soups, stews and pretty much anything braise always taste better the next day! (Or the day after that.) All you have to do on the day of your feast is reheat and focus on having a good time. 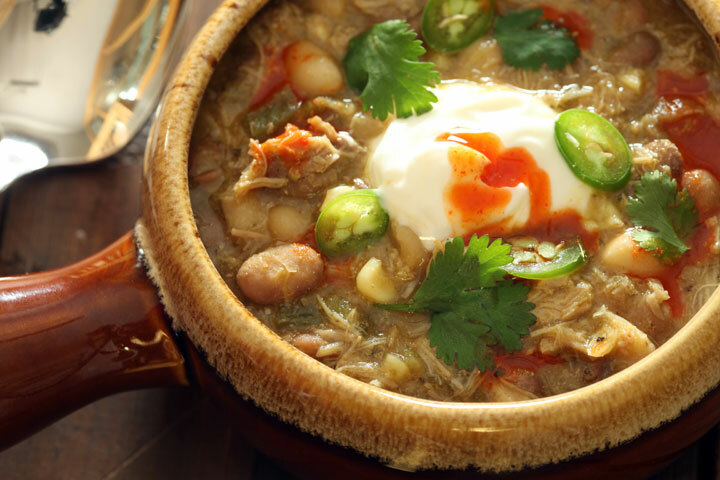 Though I developed this tangy shredded chicken chili verde with poblanos, sweet corn & navy beans using Knorr Homestyle Chicken Stock with the holidays in mind, it would be great on any cold winter’s night. (Also – the leftovers would be great the next morning over some eggs. Mmmmmm.) 😉 If you like a less spicy chili feel free to omit the jalapeno in the recipe, or if you like it spicier feel free to throw in a second one. Recipes are merely guidelines. Let your taste buds lead the way! Add bacon to a large pot over medium-low heat. Cook bacon until most of the fat has been rendered out and bacon is crisp, about 10 minutes, flipping occasionally for even cooking. Drain bacon strips on paper towel, crumble then reserve for later. Leave the rendered fat in the pot and raise heat to medium-high. While the bacon is cooking toss the chicken pieces with flour and season with kosher salt and freshly cracked black pepper. Toss to coat evenly. Once the bacon fat has heated almost to the smoking point, add half of the chicken pieces to the pot. Brown the chicken on all sides, about 4-6 minutes. Once browned, remove from pan and reserve. Add the second half of the chicken to the pot and repeat the browning process. Once all chicken has been browned, reduce the heat to medium and add canola oil to the pot. Once the oil has heated, about 1 minute, add the onion, bell pepper and jalapeno to the pan. Stir. Sweat the aromatics over medium heat, stirring occasionally, until the onions are translucent, about 10 minutes. Add garlic to the pot, stir and cook another 1 minute until the smell of garlic reaches your nose. Add next 8 ingredients (poblanos through the Knorr Homestyle Stock) to the pot. Stir. Cook until the Knorr stock has melted and the tomatillos have softened, about 3 to 5 minutes, stirring occasionally. Add next 4 ingredients and reserved crumbled bacon. Stir. Raise heat to medium-high and bring to a boil. As soon as chili reaches a boil, reduce heat to medium-low. Simmer over medium-low heat for 1 1/2 hours, stirring occasionally. Add corn and beans, stir, and continue to cook for another 45 minutes or until chicken is shredding apart. Taste and adjust seasoning as desired with more kosher salt and freshly cracked black pepper. Ideally the chili should be cooled to remove temperature then refrigerated for 24 hours before serving to allow flavors to marry. Reheat chili over medium heat until hot, stirring occasionally. Taste and adjust seasonings one final time if desired. Serve with sour cream, cilantro leaves, sliced peppers & hot sauce to garnish. Hey that’s a very good recipe, I’m from Brazil and love spicy food, specialy spicy chicken. I am a bodybuilder and I am always looking for meals with a lot of protein. Good job! Oh man, I would love a big lovely bowl of this comfort food!! Lori – nothing like a big bowl of chili to scream comfort! (at least for me.) I hope I get to catch up with you before too long! I know how busy you are writing that book! Xoxo! When do you add the poblano peppers? The recipe says” Add next 8 ingredients (tomatillos through the Knorr Homestyle Stock”‘ but should it be (poblano through through stock)? I made it last week and it was amazing! Great flavor, best chili I have ever had. But was not sure if I added the poblanos at the right time. Already craving! Jennifer! YES! I’m so sorry about that. Typo! It should have read “(poblanos through Knorr Homestyle Stock)”. Thank you so much for pointing that out to me and sorry for any confusion. I’m so glad you liked the final product regardless!